This map of England and Wales is by Christopher Saxton and dates from 1583. It was published separately from Saxton’s atlas of 1579. Only two copies of this map are known to exist. Christopher Saxton is first recorded in 1570 as an apprentice to John Rudd, Vicar of Dewsbury from 1554 to 1570, whose keen interest in cartography had seen him engaged in the 1550’s in making a ‘platt’ of England. The period during which Saxton worked saw great advances in the field of cartography, particularly by the Dutch and Flemish. Saxton’s pioneering maps were made possible by advancements in draughtsmanship and surveying which emerged in part as a result of the practical needs of military engineers. By the 1540 military surveyors were well able to draft plans and topographical maps to scale. A large number of treatises on surveying appeared, responding to a desire to formalise land boundaries, military textbooks were published explaining the use of the cross-staff for surveying lengths and distances. These advances lead to the construction of increasingly sophisticated surveying instruments resulting in a new accuracy in mapping. This map was produced under the patronage of Thomas Seckford, a Master of Requests to Elizabeth I, who had commissioned Saxton’s atlas of county maps, a project overseen by Lord Burghley, Secretary of State, whose administration increasingly involved the use of maps. The map is extremely large, measuring approximately 4foot by 5 foot and is engraved over 20 sheets to a scale of about 8 miles to the inch. Saxton has used the old English mile of 10 furlongs, the 8 furlong mile was not confirmed until 1593. The map does not include the name of an engraver but it generally accepted that it is Augustine Ryther, who engraved Saxton’s earlier map of England published in his county atlas. Ryther was the most accomplished of a team of seven English and Flemish engravers who worked on the county maps in the atlas. Comparison with the county maps shows that Saxon has modernised the spelling several of the place names on this map. Notably the Isle of Wight has been redrawn. 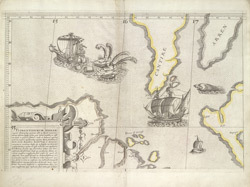 It is thought that this map is actually a reprint from the original plates dating from the 1640’s, this idea relates to watermarks visible on the paper that the map is printed on. After Seckfords death in 1587 Saxton seems to have lacked an alternative patron and he turned his skills to estate and town plans. Political difficulties prevented him from carrying out surveys of Scotland or Ireland. Saxton’s image of England and Wales, shown here, was a significant advancement on previous maps. All place names are now in the English form, and as a consequence of the improvements in surveying techniques, the proportions of the land mass are more accurately portrayed than before. This image of England and Wales was adopted by Mercator, Speed, Blaeu and Jansson and was recognised internationally as the standard representation of England and Wales.